Marla Zide's journey into the legal field started at a very young age when she would ask if she could tag along on Saturdays when her father, a dedicated legal professional would go into the office. Ms. Zide, a New England native came to Maryland in 1993 to attend Goucher College. Ms. Zide graduated from Goucher in 1997 with a BA majoring in psychology and minoring in Women's Studies. Marla Zide is a 2001 graduate of the University of Baltimore School of Law where she concentrated in family law. She participated in the Family Law Clinic at University of Baltimore for two semesters. While attending University of Baltimore, Ms. Zide worked at the Maryland Legal Service Network (MLAN), working to network different legal service providers throughout the state. While working at MLAN, Ms. Zide also assisted in developing the People's Law Library. Ms. Zide, since being sworn into the Maryland Bar in December 2001 she has concentrated her practice in family law. Ms. Zide's litigation career started at the YWCA of Annapolis and Anne Arundel County representing parties in Protective Order hearings. 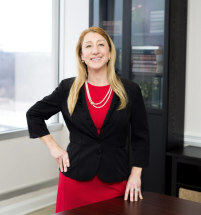 Her litigation career continues primarily in Anne Arundel County, however Ms. Zide also practices in Baltimore City, Baltimore County, Howard County, Harford County, and some of the Eastern Shore Counties. She represents, parents, grandparents, other third parties and children in contested matters involving separation, divorce, custody, visitation, child support, alimony, family support, and adoption. Marla Zide dedicates herself to advocating for her clients. She recognizes that family law cases are extremely stressful and parties need direction and focus from their attorney. Ms. Zide strives to make each one of her clients feel like they are the only client and truly is a counselor of law in every sense of the word. Ms. Zide's dedication to service is evident by her involvement with the Maryland State Bar Association (MSBA), Women's State Bar Association (WBA) and local Anne Arundel County Bar Association. Ms. Zide is a past chair of the Young Lawyers Section (YLS) of the MSBA. She is active in the judicial selection committee, planning committee and public awareness committee. Ms. Zide was the 2011 recipient of the David Hortzberg Award, recognizing solo and small firm lawyers. Ms. Zide was recognized in 2010 and 2011 as a Rising Star in Maryland Super Lawyers.